Today’s half marathon — my first — went pretty well all round. I was a bit worried by the amount of rain I could hear before I set out, but it turned into occasional drizzle for the race, which is perfect jogging weather, really — no need to worry about overheating. I felt fine through the whole Portway section, and only really started flagging when we got to around the eighth mile, at the start of Cumberland Road. I grabbed a Lucozade thingy from the helpful army people handing them out around there, though, and also ate half my Mule energy bar thing as I trogged down Cumberland Road and into town. I don’t know if that really helped — frankly I’m not keen to try a control experiment of doing another half marathon without them! The city section was definitely the hardest. My thighs were starting to become a bid leaden, plus you have to jog within about half a mile of the finish line, but go past it and on a circuitous route around Queen Square, through Redcliffe and around Castle Park and back. That last hill up Wine Street was a bit of a killer. Still, the good thing about the city section is that there are people here there and everywhere cheering you on, and reminding you that there’s only three miles left to go, then only two miles left to go, then finally you’re on the last mile and you know you’re going to finish. I kept jogging all the way to the end, though I didn’t have anything left for a final burst of speed. It was all I could do to keep standing up, frankly. I saw a few familiar faces, mostly from Twitter, on the way around, meeting @jorence on the way to the start, waving at @mikeotaylor on the way past the starting line, and apparently @parryphernalia saw me coming through the finish, though I was too intent on just keeping going without actually dying to notice… Apologies if you saw me and waved and I carried on oblivious; I was trying to stay vaguely aware of my surroundings, but it’s quite easy to descend into “tunnel vision” as you go along. Looks like my time will be somewhere around three hours; my RunKeeper log suggests 3:03:38, but I did set it off a little in advance of hitting the starting line, so I can’t be sure whether I’ll be over or under 3 hours. But frankly, who cares? 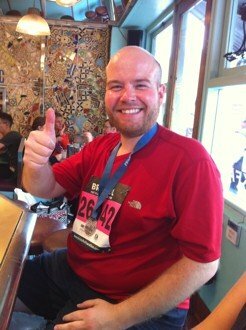 I just ran my first half marathon! EDIT: whoo hoo! Just checked the website, and my official time is now in. I must have set my timer off a fair bit in advance of the start, as it turns out, as my time was… 02:53:43! So, comfortably under three hours, and I’m very happy indeed with that. Of the non‐Twitter people, the ones I was expecting to see didn’t let me down. My friends Mike and Jess were there near the finish to cheer me on, and picked me up afterwards to walk me up to Rocotillos and buy me one of their utterly deadly milkshakes — this time I had a cookie dough milkshake, extra thick, and I think that pretty much replaced all of the 2,362 calories I’d just burned off, according to the RunKeeper log. Thanks to everyone who sponsored me. Looks like I’ll end up raising more than £500 for Cancer Research, once my company matches the donations, which is fantastic. Well done Matt. I could tell from the way you went out that it was in the bag already!